An international team of neuroscientists claims to have successfully carried out a head transplant on a monkey, along with other related experiments. But because the details haven’t been published, experts remain sceptical. Warning: Graphic image to follow. As New Scientist reports, the procedure was led by Sergio Canavero, a neuroscientist who works for the Turin Advanced Neuromodulation Group in Italy. Canavero made headlines last year by suggesting that head transplants are about to become a reality, and that the medical technology required to perform such a seemingly radical procedure already exists. At the time, Canavero said the first human head transplant would happen in about two years. If this latest development is true, his team appears to be right on track. 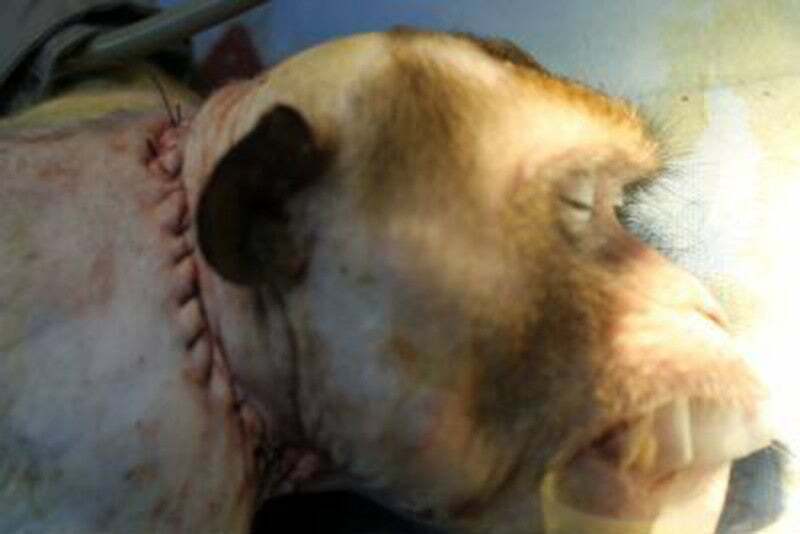 According to Canavero, researchers led by Xiaoping Ren at Harbin Medical University, China, have carried out a head transplant on a monkey. They connected up the blood supply between the head and the new body, but did not attempt to connect the spinal cord. Canavero says the experiment, which repeats the work of Robert White in the US in 1970, demonstrates that if the head is cooled to -15 °C, a monkey can survive the procedure without suffering brain injury. “The monkey fully survived the procedure without any neurological injury of whatever kind,” says Canavero, adding that it was kept alive for only 20 hours after the procedure for ethical reasons. New Scientist was, however, unable to obtain further details on this experiment. Ren’s team has also performed experiments on human cadavers in anticipation of reforming the surgery on live patients. Although the monkey’s spinal cord was not re-fused, the team says it may be possible if the spinal cord is cut cleanly in a bath of polyethylene glycol (PEG), a chemical that preserves nerve cell membranes. New Scientist says it has seen images and videos of some of the procedures described by Canavero, including this video of a mouse sniffing and moving its legs weeks after having its spinal cord severed and then re-attached. Details of the procedures are set to appear the journals Surgery and CNS Neuroscience & Therapeutics. New Scientist hasn’t seen the papers—of which there are apparently seven—and cannot verify the claims. Looking ahead, Canavero is hoping to raise money so that he can offer a head transplant to a 31-year-old Russian patient suffering from a genetic muscle-wasting disease. He says he’s going to ask Facebook founder Mark Zuckerberg to finance the surgery. The director of a hospital in Vietnam has already offered a facility to host the procedure. The idea of head transplants sounds outlandish, but Canavero may be onto something. Such an achievement would introduce an entirely new field of research for spinal cord reconstruction, while offering hope to patients who can’t wait for advances in gene therapy and stem cells. Definitely a story we’ll be watching.